Soldiers to citizens by Karl James. For those troops serving in the islands at the end of the Second World War, the wait to return to Australia could be frustratingly slow, and led to protest and an act of sabotage. Welcome Home: Vietnam vets return from war by Elizabeth Stewart. It is often forgotten that Vietnam veterans received enthusiastic Welcome Home parades. Coming home in 1857 by Craig Wilcox. Home but still apart by Steven Bullard. For some of the troops who returned to Australia during the influenza pandemic of 1918–19, the reunion with their loved ones was delayed. After the shooting stopped by Robert Nichols. 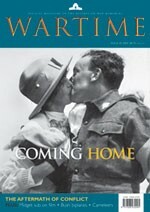 After the armistice the priority was to get the soldiers back home. A time of mixed emotions by Ian Hodges. Peacekeepers react to their time abroad in different ways. Biplanes from the bush by Peter Stanley. A long-forgotten patriotic fund provided aircraft for the British Empire in the Great War. Bringing Cobbers to Australia by Ross McMullin. How a stirring sculpture at Fromelles came to be replicated in Australia. From the Mounties to Middle Head by Michael Tyquin. The life of a founder of Australia’s defence forces exemplified a colonial career. “Triumphant return in silence” by Keiko Tamura. The Japanese midget submarine attack in Sydney turned the crew into heroes on the silver screen. Heilly: front-line village by Peter Burness. A small French village found itself close to the fighting during the First World War. The furoshiki by Ally Roche. Memories came wrapped in a Japanese soldier’s cloth. Australia’s cameleers by Elspeth Grant. The Imperial Camel Corps’s Australian soldiers were rough diamonds, helped by one of our Muslim cameleers. The Bluebirds in France by Les Hetherington. In 1916 a group of Australian Red Cross nurses travelled to help the sick and wounded. Aussie VC winners in North Russia by Michael Challinger. After the First World War, Australian soldiers took part in an almost forgotten action.